I’m on my holidays now, so I’m planning to do quite a lot of baking and cooking. I’ll have lots of recipes you’ll hopefully be interested in learning over the next couple weeks. Sticking with the theme of super fast healthy dinners, I give you Chorizo and Chickpea Linguine. Literally less than 15 minutes from ingredients to the plate. Put the linguine on to cook, in saucepan of boiling water. 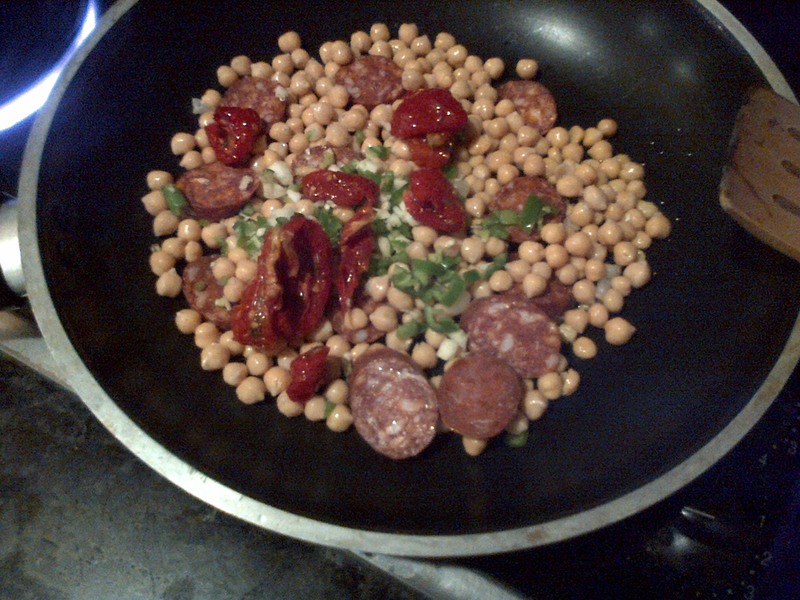 Meanwhile, place the chilli, garlic, chickpeas, tomatoes and chorizo in a pan to cook slowly. We don’t need to use any salt as seasoning here, as the chorizo will provide plenty of flavour. 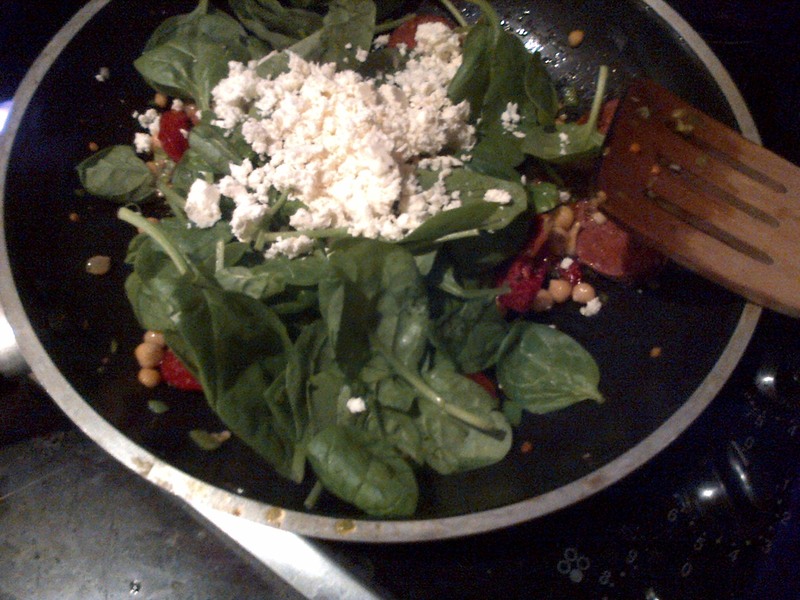 When the linguine is almost cooked, add the spinach and feta to the chickpea mixture and allow to cook. Once the linguine is cooked, add it to the chickpea mixture. Mix well and serve. 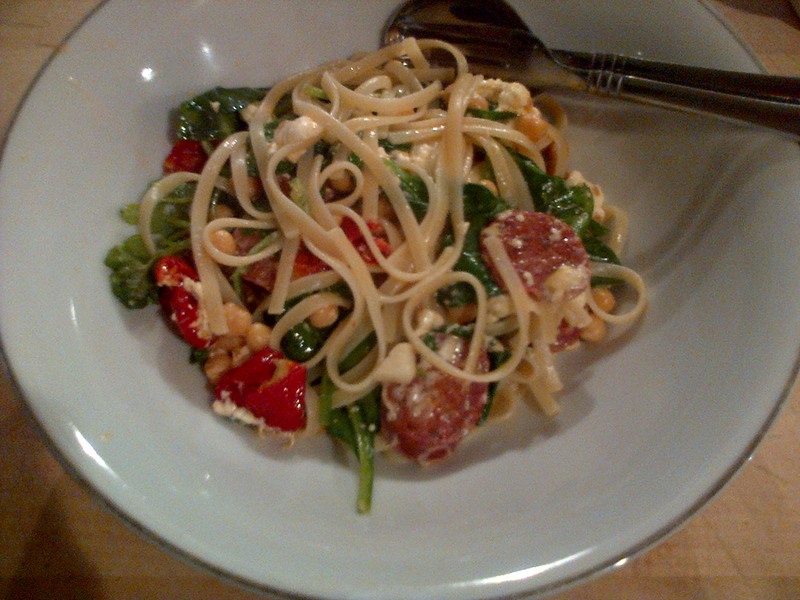 This entry was posted in Food Glorious Food and tagged chickpeas, chorizo, convenience cooking, fast cooking, feta, food, healthy recipes, linguine, no fuss cooking, semi sun dried tomatoes, spinach by Tasty Inspirations. Bookmark the permalink.